This is a hand signed 7" x 4.5" colour photograph by the American Athlete who won Olympic Gold in the Decathlon at the 1976 Montreal Games. Caitlyn Jenner (born October 28, 1949), formerly known as Bruce Jenner, is an American television personality and retired Olympic gold medal-winning decathlete. Jenner was acollege football player for the Graceland Yellowjackets before incurring a knee injury requiring surgery. Coach L. D. Weldon, who had coached Olympic decathlete Jack Parker, convinced Jenner to try the decathlon. 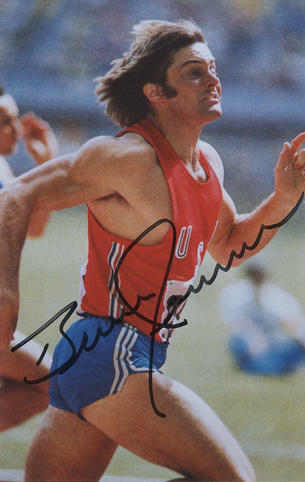 After intense training, Jenner won the 1976 Olympics decathlon title at the Montreal Summer Olympics (after a Soviet athlete had won the title in 1972 during the Cold War), gaining fame as "an all-American hero". Jenner set a third successive world record while winning the Olympics. The winner of the Olympic decathlon is traditionally given the unofficial title of "world's greatest athlete." With that stature, Jenner subsequently established a career in television, film, writing, auto racing, business and as a Playgirl cover model. Jenner has six children from marriages to ex-wives Chrystie Crownover, Linda Thompson, and Kris Jenner. Since 2007, Jenner has appeared on the reality television series Keeping Up with the Kardashians with Kris, their daughters Kendall and Kylie Jenner, and step-children Kourtney, Kimberley, Khloé, and Rob Kardashian. Previously identifying publicly as male, Jenner revealed her identity as a trans woman in April 2015, publicly announcing her name change from Bruce to Caitlyn in a July 2015 Vanity Fair cover story. Her name and gender change became official on September 25, 2015. She has been called the most famous openly transgender woman in the world. Jenner currently stars in the reality television series I Am Cait, which focuses on her gender transition.